A c o n s t r u c t i o n contract expected to exceed $20 million has been awarded to Bath Iron Works by Sun Ship, Inc. to construct a 643-foot oceangoing barge for the California and Hawaiian Sugar Company. The vessel, the size of a major merchant ship but designed to be pushed by a tugboat, is intended to carry raw sugar and liquid fertilizer. 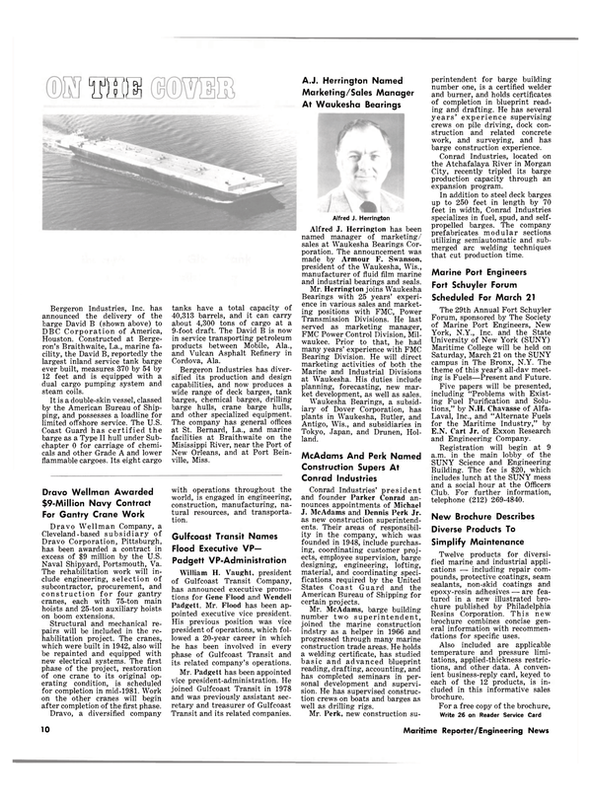 In announcing the award, BIW chairman John F. Sullivan Jr. said the project will require about 300 workers at its peak, with the barge planned f o r delivery in March 1982. He said the contract raises the backlog of the shipyard, which is a Congoleum company, to a peacetime record of approximately $767 million. It is the second major project subcontracted to BIW by Sun Ship, Inc. of Chester, Pa., since last September. The first was a contract of approximately $30 million to construct a hopper dredge.